Just when you finished replacing all your VHS tapes with DVDs, you heard that there are two new kids on the block, HD DVD and Blu-ray. They both claim that they're the successor to DVD, and that eventually they're going to replace it completely. If you've been watching this fight from the sidelines, confused by the differences between the competing standards, keep reading, and we'll explain some of the technical details behind the marketing hype. First, let's examine the reasons for a change in media. According to the DVD Forum, consumer research shows that television screens larger than 36� rate �poor� in picture quality when watching standard definition content. By moving to high definition content, picture quality was rated as �good� up to and above 60� diagonal screen size. However, high definition content requires more space and bandwidth than a current DVD can offer. Dual Layer DVDs can provide a maximum data transfer rate of 11 Mbps, compared to the 25 Mbps is considered by some to be the the ideal for high definition content. 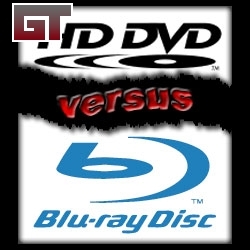 Both HD DVD and Blu-ray solve this problem by switching from the 650nm red laser currently used in CD and DVD drives to a 405nm blue laser, which allows more data to be stored in the familiar 120mm disc form factor. Beyond this basic similarity, their offerings show opposite mentalities; HD-DVD a conservative one, and Blu-ray a revolutionary one. HD DVD (High Definition Digital Versatile Disc) doesn't stray far from the DVD standard. This isn't surprising, since it's supported by the DVD Forum, who voted in 2003 that it should replace DVDs for high definition content. The switch to a blue laser increases the capacity to 15GB for a single layer disc, or 30GB for a dual layer disc, more than enough for a high definition movie, but the disc composition remains the same, with the readable layers sandwiched in the middle of a protective 1.2mm plastic disc. This approach has a major advantage in that it is extremely simple for equipment manufacturers and disc replicators to switch from regular DVD to HD DVD production. According to DVD Forum press releases, a HD DVD Production line has been changed over to conventional DVD replication in under five minutes. This has won the support of some major tech powerhouses and manufacturers, such as Intel, HP, Microsoft, NEC, Sanyo, and Toshiba. Toshiba deserves a special mention, as on April 18, 2006, they released the first HD-DVD players. The HD-A1 and HD-XA1 ($499 and $799 at time of release, respectively) sold out quickly from many stores, despite the only HD-DVD titles available at release being Million Dollar Baby, The Last Samurai, Phantom of the Opera, and Serenity. At the moment, Blu-ray players are not available for purchase.